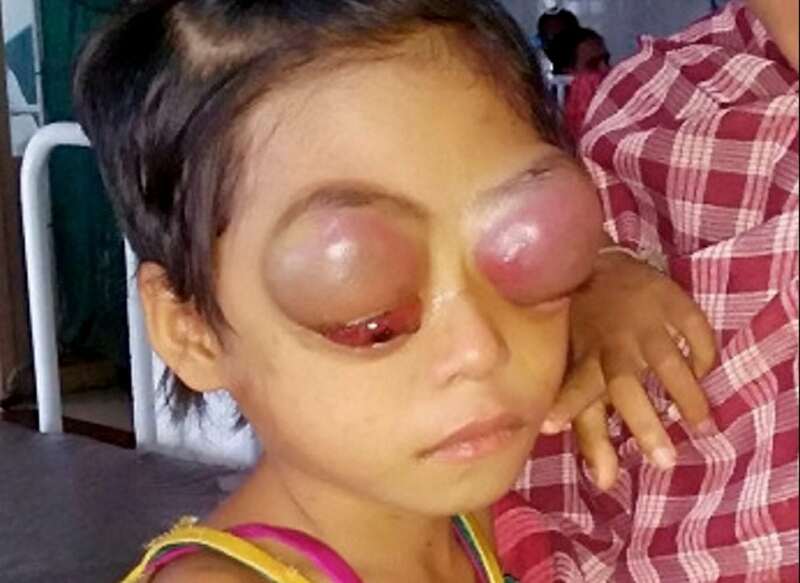 Desperate parents are pleading for help to cure their six-year-old daughter of a rare cancer that causes her eyes to bleed – and POP OUT. 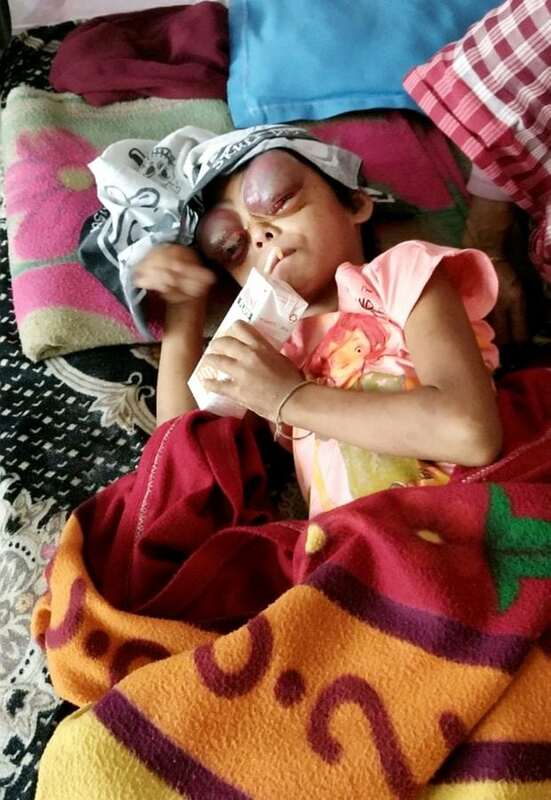 Brave Dhanika Tripura, six, was seemingly totally healthy until just six weeks ago when her eye area started to swell up, with blood building up beneath her skin. Medics diagnosed acute lymphocytic leukaemia and she needs £11,550 to pay for specialist treatment to save her life. Her desperate parents Dhanya Kumar Tripura, 45, and Shashikala, 40, are pleading for help before its too late. Mum-of-four Sashikala, from Battali in north east Indian state of Tripura, said: “My daughter was completely normal until one and a half months ago. “The symptoms started with her eyes getting well up every now and then. “I thought she was suffering from some internal pain that was why she was crying. “A few days later her eyes started swelling up. “Her situation is worsening with every passing day. Father Dhanya, added: “I appeal to all kindhearted people to help me save my daughter. “If you are also a parent I know you all can feel my pain. Little Dhanika is currently being treated by medics at Dr B Borooah Cancer Institute in Guwahati, where medics have given her a 10% chance of survival. The family has been told that Dhanika must start chemotherapy in the coming days – and should be moved to a bigger hospital in Mumbai. But they can’t afford the Rs 10,00,000 bill it would incur. Family friend Tapan, who is trying to fundraise, said: “Dhanika’s father is a poor farmer who somehow manages to make ends meet. A crowdfunding campaign has been started by charity UTF. Volunteer Riyad Debbarma said: “The doctors have told us that time is crucial in her case. With every passing day, her condition would deteriorate. 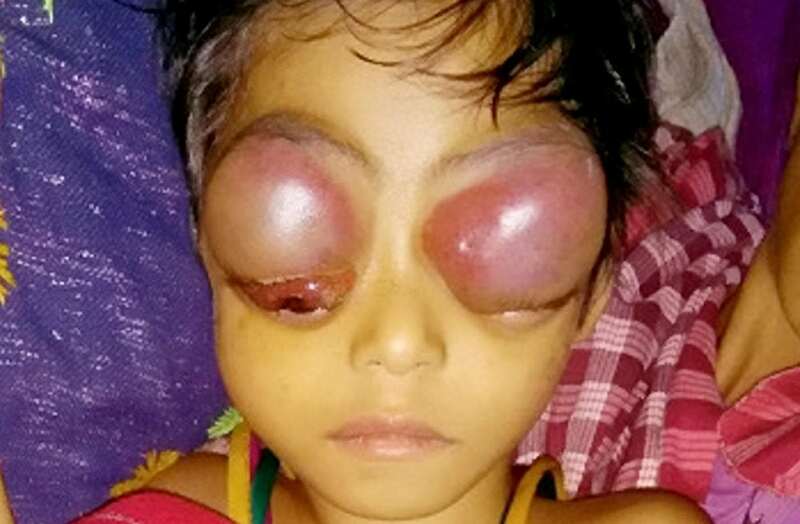 Dr Sunil Bhat, who treated and cured a four-year-old boy Sagar Dorji suffering from the same condition as Dhanika, said help is needed quickly. “If the child is taken to our facility, we will be able to start her treatment,” he said.